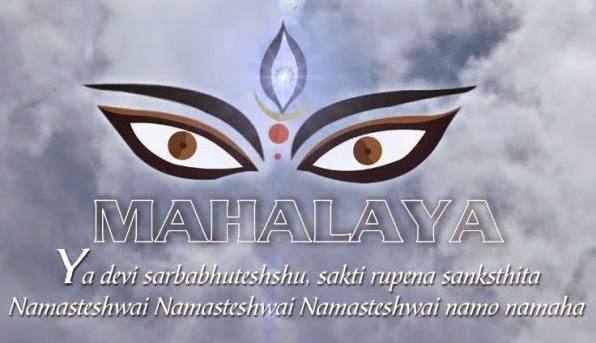 "Mahalaya day”, the day Durga was assigned the task of eliminating evil. An invitation to the mother goddess to descend on earth - "Jago Tumi Jago". The traditional six day countdown to Mahasaptami starts from Mahalaya. Goddess Durga visits the earth for only four days but seven days prior to the Pujas, starts the Mahalaya. The enchanting voice of Birendra Krishna Bhadra fill up the predawn hours of the day thus marking the beginning of “devipaksha”and the beginning of the count-down of Durga. It is an auspicious Indian occasion observed seven days before the Durga Puja, and heralds the advent of Durga, the Goddess of supreme power. The dark fortnight of Aswayuja is known as the Mahalaya Paksha or the fortnight specially sacred for offering oblations to the departed ancestors. Durga - goddess of deliverance - comes to earth on the seventh day after the autumn new moon. She is depicted by the 'kumors' or potters as a resplendent golden figure standing on a lion's back, each of her ten arms bearing a particular weapon, as she triumphs over the demon Mahisasura. From this day starts 'Devipaksha' and marks the end of 'Pitri-paksha'. It is the day when many throng to the banks of river Ganga, clad in dhotis to offer prayers to their dead relatives and forefathers. People in the pre-dawn hours pray for their demised relatives and take holy dips in the Ganges. This ritual is known as 'Torpon'. This day bears immense significance for the Bengalis. It is according to the myths that Sree Rama hastily performed Durga Puja just before he set for Lanka to rescue Sita from Ravana. According to Puranas, King Suratha, worshiped Goddess Durga in spring. Thus Durga Puja was also known as Basanti Puja. But Rama proponed the Puja and worshiped Durga in autumn and that is why it is known as 'Akal Bodhon' or untimely worship. It was considered untimely as it is in the myths that puja was performed when the Gods and Goddesses were awake i.e. "Uttarayan" and was not held when the Gods and Goddesses rested ie."Dakshinayan". It was on the day of Mahalaya, the beginning of "Devipoksha", the Gods and Goddesses woke up to prepare themselves for Durga Puja. Akashvani Mahalaya: In the year 1930, Mahalaya was first broadcasted over the radio in Akashvani. The programme was organised by Premankur Aatorthi, Birendra Krishna Bhadra, Nripendra Krishna Mukhopadhya and Raichand Boral. It was broadcasted live then. Later it was recorded and played. Bengal's cine star, Uttam Kumar had once recited Mahalaya while Hemanta Kumar Mukhopadhya was the music director. But it was not popular among the mass and from then it has always been the voice of Birendra Kishna Bhadra enthralling the listeners in the pre-dawn hours of Mahalaya. The script was written by Bani Kumar, music was directed by Pankaj Kumar Mallik while Dijen Mukhopadhya, Manobendra Mukhopadhya (Tabo Achinta....), Sandhya Mukhopadhya, Arati Mukhopadhya, Utpala Sen, Shyamal Mitra and Supriti Ghosh (Bajlo tomar alor benu....) sang in their melodious voices.